In this unit you will learn simple and compound meters. You will also begin to sight-read compositions created especially for this series! In Unit 2 you learned to describe meter in terms of how a measure is broken down into beats. Duple meter is broken into two beats per measure; triple meter into three beats per measure; and quadruple meter into four beats per measure. The terms introduced in this unit—simple and compound—describe how a beat is broken down into smaller subdivisions. 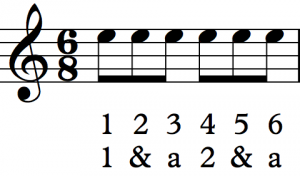 Simply put, beats are typically subdivided (AKA broken down) into twos or threes. Meters that subdivide most of the beats into two equal parts are called simple meters; meters that subdivide most of the beats into three equal parts are called compound meters. This seemingly small distinction makes huge difference in feel. For me, music in simple meter feels angular, whereas music in compound meter feels round. Let’s explore this distinction further. Both examples below consist of four beats per measure and are therefore in quadruple meter. However, the first one is in simple quadruple meter and the second is in compound quadruple meter. Here is an example of simple meter because each beat is broken into two equal parts. Another way to express the same idea is that each beat is represented by a quarter note. Here is an example of compound meter because each beat is broken into three equal parts. Notice how the eighth notes are beamed in groups of three. Another way to express this idea is that each beat is represented by a dotted-quarter note. In simple duple meter most beats divide into eighth notes. There are two beats per measure and each beat is a quarter note. In simple triple meter most beats divide into eighth notes. There are three beats per measure and each beat is a quarter note. In simple quadruple meter most beats divide into eighth notes. There are four beats per measure and each beat is a quarter note. In compound duple meter most beats divide into three eighth notes. There are two beats per measure and each beat is equivalent to a dotted-quarter note. This meter can be counted in a variety of ways. The graphic below presents two options. I recommend using the second option because it emphasizes the duple feel. In compound triple meter most beats divide into three eighth notes. There are three beats per measure and each beat is equivalent to a dotted-quarter note. This meter can be counted in a variety of ways. The graphic below presents two options. I recommend using the second option because it emphasizes the triple feel. In compound quadruple meter most beats divide into three eighth notes. There are four beats per measure and each beat is equivalent to a dotted-quarter note. This meter can be counted in a variety of ways. The graphic below presents two options. I recommend using the second option because it emphasizes the quadruple feel. The hemiola is an exciting device in which rhythmic accents switch from two beats subdivided in three parts to three beats subdivided in two parts (or vice versa). Hemiolas happen in compound meter (see the first example below) and in simple meter (see the second example below). I suggest you emphasize the change in accent whenever you encounter a hemiola. It creates excitement and energy. To determine meter, you can employ the following short cut. Look to the top number of the time signature. As you learned in Unit 2, the bottom number of the time signature, in simple meter, corresponds to the type of note that becomes a single beat (AKA pulse, in this case). Therefore, if the bottom number is ‘4,’ then each beat is represented by a quarter note. It’s pretty simple, which is why it is called simple meter. In compound meter, the bottom number of the time signature corresponds to the type of note that becomes a one-third division of the beat (AKA pulse, in this case). If compound meter is notated such that the dotted-quarter note is the beat/pulse (as in our examples above) the eighth note is the one-third division of the dotted-quarter. Hence, the number “8” takes the place of the bottom number of the time signature. Sight-reading empowers you to engage with music you may have never heard before. Many musicians derive oodles of joy from bringing music notation to life for the first hearing. It is like unwrapping a present! Further, sight-reading creates an opportunity to decide whether a piece is worth investing the time needed to make it performance-ready. When I started sight-reading for the purpose of scouting new performance repertoire, I finally stopped confusing the act of sight-reading with the act of performing. When I sight-read, my goal is to get a sense of the shape, character and difficulties of a piece. Sometimes, mistakes do not get in the way of achieving that goal, which is why they can be ignored. However, when I prepare for performance, my goal is to master the shape, character and difficulties of a piece. In this case, mistakes are crucial to goal attainment. Mistakes are obstacles that, when overcome, clear the path to greater mastery. I want you to experience the difference between a sight-reading attitude and a performance-preparation attitude. This was one of my motivations for commissioning composers to write over thirty original duet compositions for this series. You do not have to perfect these compositions. All you have to do is sight-read them. If you don’t like the piece, feel free to continue through the series without mastering it. However, if you do like one or more of the compositions, I encourage you to shift from a sight-reading attitude to a performance-preparation attitude so you can add them to your performance repertoire. The original compositions are available in the Appendix as a collection entitled The Obelisks. 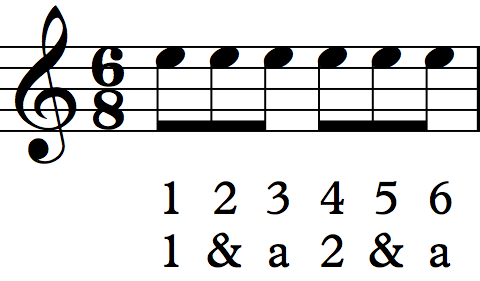 Throughout this unit the count-in click for pieces in compound meter will include the eighth note subdivision of each beat. An emphasis will be placed on the beginning of each beat to help establish the compound meter feel . The compositions composed for this series are complied into a collection called The Obelisks. The collection is available for viewing and downloading in the Appendix (forthcoming). I hope you are inspired to perform these pieces and learn about the composers who contributed to this series.